A story for you, written in front of your eyes, about any subject that you ask for. 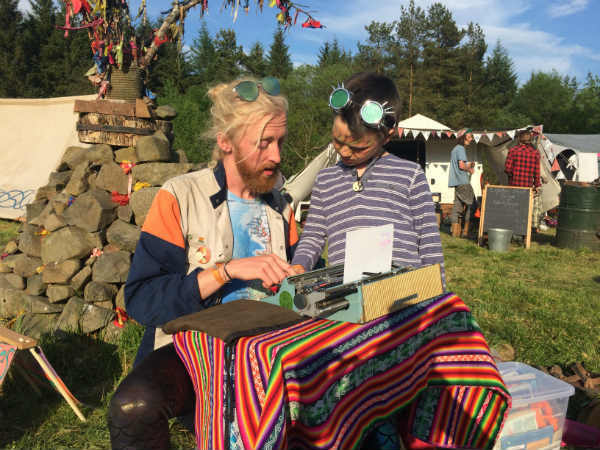 Luke is a live story writer who writes custom stories for your guests, about any subject they would like a story about, on an old typewriter, live. When each bespoke story is finished, it is read by Luke to the person who requested it, and then packaged into a golden envelope, to be taken home. The stories become beautiful little objects that people treasure. Stories for event attendees allow guests, quite literally, to have a story about the event to take home. During an event, the story writing service is a great conversation starter, and provides long-lasting mementos long after the event is over. 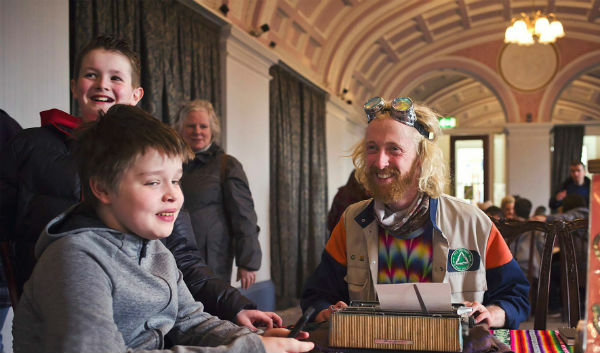 The live stories are typed using a rainbow ink ribbon that Luke has made by hand, which changes the colour of ink as the story progresses across each page. Everyone has an incredible story within them, and writing live stories for people allows people to remember that. Live story writing provides a quiet, soulful activity at an event, with the real power to engage hearts. A live story writer, like Luke, releases a sense of play in people and ignites inspiration. 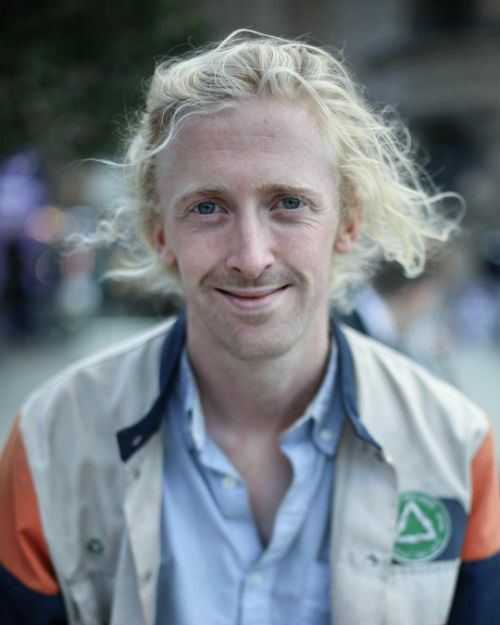 Since 2013 Luke has written live stories for strangers all over Europe and the United States. He has performed in the streets of Paris, New York, Berlin and London. 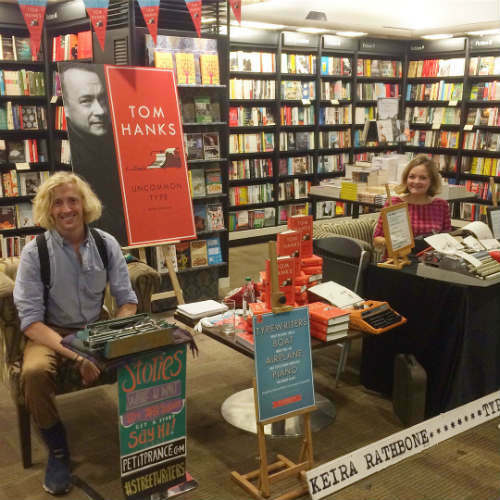 He’s performed as a live story writer in Waterstone’s flagship store in Picadilly, and been the support act for typewriter lover, Tom Hanks, at his book launch. Luke has published two collections of the stories that he has written around the world. He regularly performs at music and literature festivals, in-store events and at private parties. Our Tom Hanks book signing was made even more delightful by having Luke and his stories there. We hope to have you here again at some point this year. Annie Martin, head of VM at Waterstones Piccadilly, London. This what one person posted on our Facebook page; ‘Thank you so much for being such a wonderful host to such an incredible story-maker . Visiting the shop this afternoon and seeing Petit Prance composing his prose on his trusty old typewriter has to be one of the most special things my son and I have ever been a part of. My son’s story is already so precious. Such a humble and kind talent and a truly beautiful shop where the magic makes your soul sparkle from the moment you step inside. Again, thank you. Having met Luke doing his thing at a music festival last summer, I knew he’d be a great addition at Paisley Comic Con. 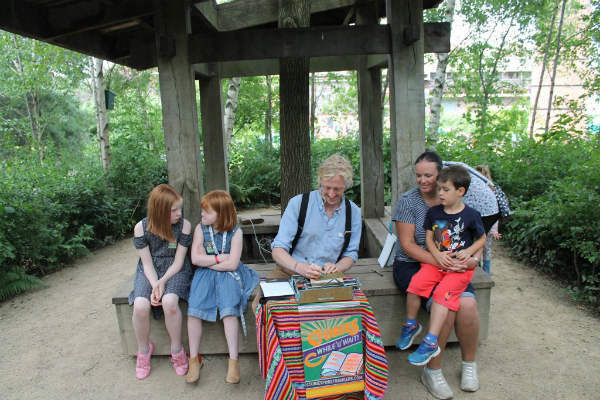 I think this was the first time Luke’s stories had graced this kind of event, but he was a huge hit with the families and young people attending. He’s great with kids, and got them really excited to come up with fun ideas. The stories Luke creates are always really touching and entertaining, and so beautifully presented you want to keep them forever. If he’s in the country next year we’d love to have him back! Luke, AKA Petit Prance is a Fairy Tale character indeed with his simple but powerful presence powering out the most surreal and magical of stories, charming the young and old alike. This wonderful artist feel like he has been typing by the fireside at The House of Fairy Tales from the beginning of time.